Product Condition: The Apex Bionic 2 Softshell Jacket - Women's is in Good condition. This was owned for just one week, it did not see much use and looks very nice. There is some pet hair on it, but a washing will take care of that. I found no further issues or defects, get a great deal on this jacket today! *Sold as is, all warranties void. Even when the wind is howling and the temperatures drop, you still have a run to go on, errands to finish, and a dog to walk. 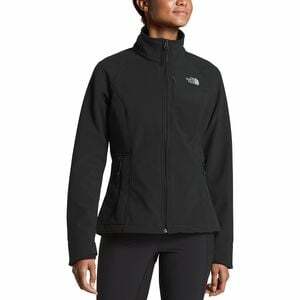 The North Face Womenâ€™s Apex Bionic 2 Jacket defies the chill with luxurious coziness. Supremely soft fleece lines the interior for next-to-skin comfort, and the DWR-treated WindWall exterior is windproof and highly water-resistant to protect you from the elements. When you're out and about, you can stash a phone in the hidden zippered chest pocket and keep your paws warm in two zippered hand pockets. A hem cinch cord and internal stretch comfort cuffs help seal out cold air, and the relaxed fit and generous stretch of the jacket move and breathe with you whether youâ€™re on a misty hike, snowshoe trek, or just zipping around town.